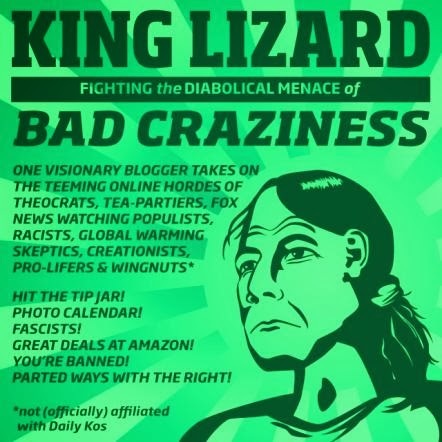 So stunningly rapid was his descent into obscurity that every post about the Lizard King’s latest self-humiliation must be prefaced with a reminder that he actually used to be somebody — cited by Rush Limbaugh! a co-founder of PJ Media! — until that day in October 2007 when he decided that Pamela Geller’s attendance at an anti-jihad conference in Brussels was some kind of hate crime or something. Science! Charles denounced Glenn Beck! Charles denounced Rush Limbaugh! Charles denounced the Tea Party as racist and the Great Purge began — ban! ban! ban! LGF exists now as a rancid festering cesspool of eccentric left-wing mania, filled with disgruntled trolls and mindless sycophants, a place where disagreement is disloyalty and opposition is hate. Because . . . Science! “Chuck Johnson: Race Detective” — this was it, you see? The same cut-and-paste guilt-by-association game he used against Pamela Geller was expanded: Everyone must denounce anybody or anything that offends Charles Johnson who, having appointed himself the Indisputable Arbiter of Acceptability, purges anyone who does not share his peculiar obsessions. How’s that working out for ya? Blogs that did not even exist in 2007 — e.g., Professor William Jacobson’s Legal Insurrection — have zoomed to success, while Charles Johnson has made LGF the most spectacular failure in blog history. @Green_Footballs in what way? Do you mean had diplomatic relations with? What is different re Obama and Saudi / women? The question to be answered, however, is not whether Reagan’s opposition to sanctions was tantamount to supporting apartheid. Rather, the question is, “When did Mandela turn to communists?” And the answer is, long before Reagan became president. This happened when the presidents of the United States were John F. Kennedy and Lyndon B. Johnson. If JFK or LBJ (both Democrats) protested the arrest and imprisonment of Mandela, or did anything to end apartheid in South Africa, this has escaped my notice. But as to the wisdom of U.S. policy, either under JFK or LBJ or later under Reagan, it is important to remember that the chief object of our foreign policy was opposition to communism, especially Soviet-backed “wars of national liberation” in Third World countries. Charles Johnson will not let the evident fact that he doesn’t know a goddamned thing about Cold War history (or any other history, for that matter) impede the use of his “Race Detective” skills against Ronald Reagan. The less publicized support socialist states gave the ANC was the military training of its cadres. Before the Sino-Soviet split, key ANC personnel were trained in China at the Nanking Military Academy. Soviet bloc para-military training took place in Cuba, Yugoslavia and Czechoslovakia. For more advanced training, recruits went to the Soviet Union. Unkhonto training bases in Africa in the early 1960s were mainly in north Africa. By 1964, recruits were being trained in Egypt (about 25), in Algeria (about 50-70), and smaller numbers in Ethiopia, Ghana (organized by Ghana’s Bureau of African Affairs, but with Soviet instructors), in Morocco and Tanzania. Chinese and Soviet training arrangements were made until the Umkhonto’s camps could be built in southern Africa. The first bases were in Tanzania, after independence in 1961, and in Zambia after independence in 1964. According to Anatoly A. Gromyko, the Director of the Institute of African Studies, arms, ammunition and some Soviet training personnel began arriving at these newly established Umkhonto bases after Zambia’s independence. . . . The Soviet Union, Cuba, the Eastern bloc, particularly the GDR [German Democratic Republic, i.e., East Germany], and Angola trained cadres . . . North Korea and Bulgaria helping to a lesser extent. By the early 1980s, the ANC’s Chief Representative in [East Germany] acknowledged that an increasing number of ANC cadres were being trained there in various fields, particularly law, engineering, and natural science. This was a cover for military training since Umkhonto recruits in the Soviet Union were openly identified with the ANC and the SACP [South African Communist Party], but in [East Germany] they trained in civilian clothing under the guise of doing other courses. The [South African Communist Party] was instrumental in forming Umkhonto we Sizwe. …. While Mandela made the arrangements to set up training bases for Umkhonto cadres during his Africa tour in 1962, Arthur Goldreich, a member of the SACP and Umkhonto, went to the Soviet Union and Eastern Europe for the same purpose. Although his trip was to obtain military assistance, including explosives for sabotage, Goldreich tried to convince the Soviets to directly intervene in South Africa, but they declined. They only promised military assistance and reportedly gave Goldreich $2.8 million. The fact is, the ANC was allied with the South African Communist Party and, for nearly two decades before Ronald Reagan became president of the United States, the ANC and its MK guerrilla movement were aligned with the Soviet-led communist bloc, including East Germany and Fidel Castro’s Cuba. Explain this however you wish, the immediately relevant point is, YOU CAN’T BLAME IT ON REAGAN, YOU IDIOT! @Green_Footballs You don't haven't to be a "wing-nut" to point out that Mandela turned to communists long before Reagan was in power. Facts are very important to people who care about truth, a category from which Charles Johnson long ago excluded himself. The real problem for Johnson is he wants to be seen as a deep thinker and analyst. He is neither. What made his blog “go to” in the conservative days was not his posts – which were nothing more than a link to a story with two sentences by Johnson – sometimes clever, sometimes not – it was the depth and knowledge of the people who posted comments. After Johnson banned them all, he was left with silly people who brought nothing to the table. One look at the banner and I had enough. I believe we have enough evidence from other, untainted, sources that Mandela was a card-carrying commie before they put him in prison. All too many people forget that the enemy of your enemy sometimes is — your worse enemy.